Don't Accept That Guilt Trip! If you're a woman, you probably know that we seem to be born with a guilt complex. Pine can help you say "NO" to guilt. people do, and because we let ourselves make a bigger deal out of something than it really is. But we don't just do this to ourselves. Some people simply strive to make you feel guilty, so that no matter what you do, it’s not enough. Of course, their barbs aren't usually just directed at you. They do it to everyone around them. And not just women are the object of their attention. Men go on guilt trips too. You know some of them. They’re the moms who insist that you don’t love them unless you, your spouse, and the kids spend every holiday with them. Never mind that your spouse also has a mom. 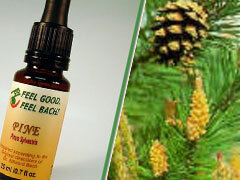 The way to say "No thanks" to their guilt trips is to use Dr. Bach's remedy Pine. But what about those people who are trying to make you feel guilty? They're suffering too -from a negative Chicory state. The truth is, they feel unloved and unwanted, and they’re trying to feel better by forcing you to give them attention. 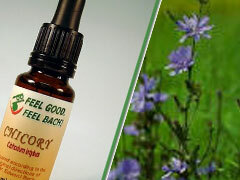 You can’t force anyone else to get help, but if you find yourself slipping into this kind of state, treat the condition with the Dr Bach's Chicory flower essence.